I do think that my house was cooler this past summer in 2018. I used screws plus the adhesive on the hooks because the summer sun is very hot where I live. In 2019, I am ordering more for the full glass storm doors. I like that I can open the curtains during the daylight hours and can look outside, but no one can look inside. Thank you very much EZ Snap. EZ Snap® Team - Thanks Judy. Happy to hear that your Window Shades are working well for you. I am extremely pleased with my EZ Snap project. I live in California’s beautiful Central Valley, and the summers are scorchers. I used the EZ Snap system to install shade cloths on my sunroom windows, and I couldn’t be more pleased. I am 76 years old, and found the installation process to be quick and easy. EZ Snap® Team - Thanks for your positive review! First off .... Thanks for prompt shipping and UPS is the best out here in northwest, nowhere AZ. This is an Excellent Product and it does lower the temperature inside our travel trailer. Installation of the adhesive snap bases and the fabric is not a challenge. I marked all of the adhesive snap base locations prior to installing the snap bases. Ensure that you clean the attachment areas around the windows with isopropyl alcohol before attaching the adhesive bases. I used 70% without mixing additional water without issues to the gelcoat or the designs on the sides of the coach. I waited the full cure time (3 days) for the adhesive backing and used 5" spacing for the snaps because we have winds in excess of 45 mph on occasion. Installation of the fabric is straightforward with paying attention to the provided installation pamphlet from EZ Snap. I ordered an additional bit of fabric just in case of oooooopps on my part. Adhere to the old adage... "Measure twice, cut once". Take no chances !! Do not stretch the fabric tight when setting the fabric onto the pins and locking it into place, you could encounter problems later on and have to redo the positioning of the fabric. Also, the snap removal tool works as advertised and comes in handy! I will buy this product again and install on our next coach. Thanks EZ Snap for a great product! EZ Snap® Team - Thanks for your positive review Brad. We purchased our second roll of shade mesh to do windows in our second house. The first roll went fast as we gave pieces to others to try and finished our primary house. in the evening... Next summer we will finish the other house, can’t wait. EZ Snap® Team - Thanks for your repeat business Carol. Really happy with the EZ Snap system. Really easy to install and remove. EZ Snap® Team - Thanks Derryl. Glad the Window Shades are keeping you cooler. Thanks to EZ Snap I've completed a 14 window project in a Snap and the house holders are so very happy with the look and expecting great heat shun performance next summer as the hot season looks to be over for this year. Expecting up to 3 other big west facing glass house projects come next June before the real heat of July hits us at our Lake Resort community. Thanks EZ Snap for making it a SNAP. EZ Snap® Team - Glad to hear it Garret... thanks for your review. Bought one window kit to try it out in our dining room which was like an oven in the afternoon. It was shocking how well it worked. We have plants in that window and I was worried they wouldn't like the lower light. After 5 weeks they're doing great. They're getting plenty of light but no heat. Just finished installing kits on all our east/west facing windows. This product does what it promises. I'm so happy I found this. Follow their directions and installation will be a piece of cake. PLANNING is everything. One more thing: the caps and studs are slippery and easy to drop. Be careful and you'll save extra trips up and down the ladder and looking for them. EZ Snap® Team - Thanks Dale, for the great review and your tips. Happy to hear EZ Snap is working for you. Just Saw your email. Checked outside my front door. And there was a tall box of EZSNAP items. Yay! Had you not alerted me, the box may have stayed there all night. Your customer service has been top-notch from the start. Much appreciated. EZ Snap® Team - Thanks Larry, hope the installation goes smoothly for your big project. Great product with data to back it up! I have been searching for years for an inexpensive way to cool my upstairs. I was almost ready to put in a second HVAC system when I stumbled upon EZ snap. The windows face west and they get pummelled by the sun. 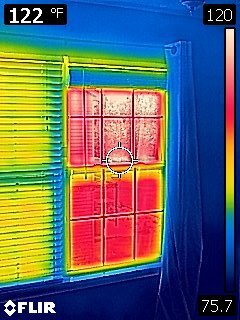 I just installed these and with my thermal imaging camera there is a 23 degree difference between the window with the solar shade and the one without. I could not even believe it. I went back every hour to check and it was still the same readings! The install was super easy and it actually looks decent. I was worried they would look like covers over the windows but they appear more like thick window screens. Hopefully they hold up long term, but for the price you really can't beat it! EZ Snap® Team - Glad to hear it... thanks for your positive review James. Best product ever. Finally got a chance to install, with the weather warmer (thanks for the heads up on making sure it was warm enough), Easy to measure, easy to install, and they look amazing. Already our front (west facing) block window is an improvement (not just for the look) in that in the afternoon when before I had to close the thermal curtains, now I can leave them open and actually touch the blocks--absolutely cool instead of incredibly hot. Our office is on the back and gets the morning sun, and the room is impossible to keep cool. So I'm excited to realize how much cooler it will be. But we really got these for privacy, because the house behind us looks right in. For the first time, I can open the curtains and see the sky, and let the light in, without feeling exposed. Not to mention the same privacy now installed in the master bedroom! So, I will tell everyone I know what a marvelous product you have. I actually have two more windows to do, and will be ordering another piece. Thanks again, may you live long and prosper! EZ Snap® Team - Glad to hear it... thanks for your positive review. You have a great, well thought out product that performs extremely well in the searing Australian sun (we get temperatures up to 46 degrees centigrade or about 115 degrees Fahrenheit - here in Adelaide in summer). And it looks good when it’s in place, unlike most other shade cloth. 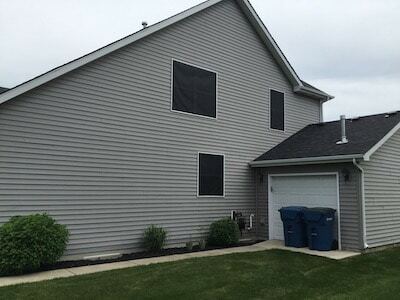 We have 4 windows shaded during last summer and it made a big difference to the temperatures inside our home and helped cut down on air-conditioning costs while adding to our comfort. These are the reasons we have decided to shade some more windows. The removability is important so that we can maximise winter sun for its warmth. EZ Snap® Team - Hello Ken from down under. Thanks for your positive review. I had a hot tub cover with the core being melted and warped my the reflection from my bedroom window. The magnifying effect was so intense. I put the EZ snap on the window and problem solved. It was easy to put on. I like the fact it can be taken off in winter. Great solution and exactly what I needed to save my $500 hot tub cover! EZ Snap® Team - Glad to help. Happy to hear your melting problem has been solved. I moved into this house a few years ago and our kitchen windows face southwest, so we get a lot of sunshine for most of the day. On very hot summer days the air conditioner would not keep up and the house temp would increase a degree or 2. Sitting by the window, I could also feel how much heat was coming through. After some research, I purchased the solar screen from EZ Snap. 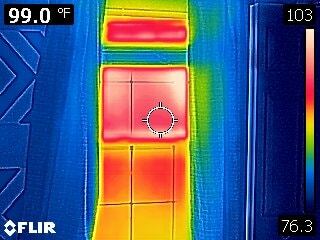 I just installed the solar screen on the outside of my windows, and waited for a full day of sun to gauge the difference, and both my wife and I were very impressed on the reduction of heat coming through the window. The install and ordering online was very simple. EZ Snap® Team - Great review. Thank you. EZ Snap® Team - That sums it up in one word, thanks. EZ Snap® Team - Thanks for letting us know. After many hours of research I found this “EZ-Snap” product the perfect solution to the problem of melting artificial turf caused by the concentration of the sunlight from Low-E glass windows. Windows with normal screens in them usually defuse the light enough to keep the reflective heat from melting the turf. However if standard aluminum screens cannot be fitted due to non-operable window or where there is only a screen on the lower opening part of the windows EZ-Snap is the great solution. All other solutions are either unsightly or come with a 10% chance of window breakage due to the glass itself overheating. If 4 windows are treated with the other film type of solution you would have a 40% chance of having to replace one of the those windows. 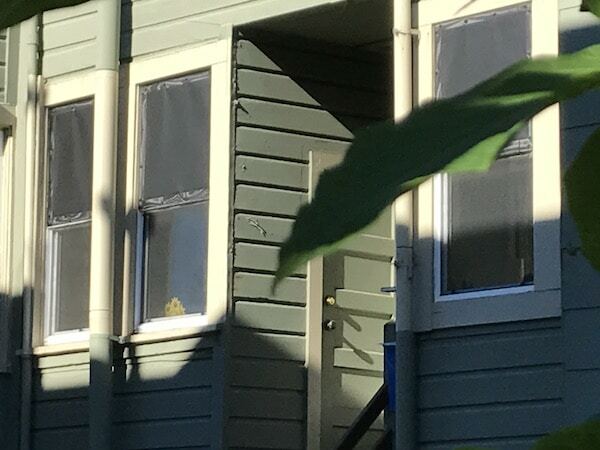 Sunlight reflected off my neighbour's south facing windows. 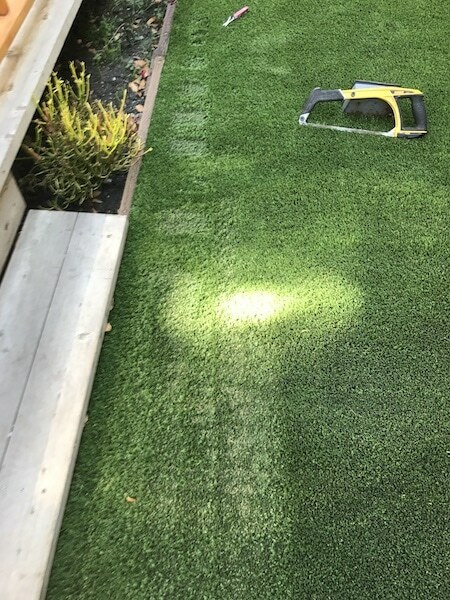 The beam of light hitting my new artificial turf. The temperature of that light at the turf is above 190 degrees. The upper panes of the upper window with the EZ-Snap window coverings installed. Looking out from the inside of the unit looks like a normal screen and does not take the view away. It also knocks the reflective heat down by about 75 %. Now I just need to repair the damaged turf. EZ Snap® Team - Thanks for sending us your review and photos Tom. We are asked about how to fix melting turf all the time. This product worked EXACTLY as advertised. Very easy to install, and it really helps keep the room cooler in the Las Vegas sun. EZ Snap™ Team - Happy to hear EZ Snap Shades are working for you. Great for attaching shade material to wood arbors or pergolas when you use the screws. Makes for easy removal come winter time. This is my second time using them and I honestly cannot think of another way that would work better. My application is a south facing wood arbor that catches a lot of breeze and the EZ Snap method holds my shade material down without any issues. I give them a 5 out of 5 stars. I also use the EZ Snaps to hold down the same shade material on my home's skylights. Again, works great and I have never had the material come loose. Thanks for a great and useful product. 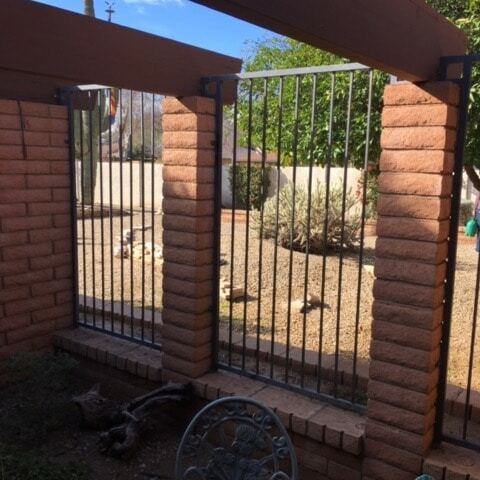 EZ Snap® Team - Your review will be helpful for others looking for do it yourself pergola ideas, thanks. I found EZ Snap on line while looking for a solution to excess solar gain in our 5th wheel while snow birding in Texas. As I considered the benefits of their product it occurred to me that I might be able to use it to solve another problem we have at home too. 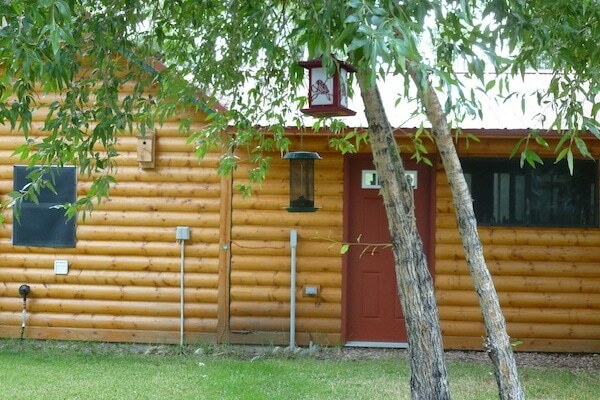 We have a building near our bird feeders that has several windows. I wondered if installing the EZ Snap Screens on those windows might help prevent bird strikes on the glass. I can say now that it was an easy solution to a heart wrenching problem. We have not had any bird fatalities since I installed the screening this spring. The screens still allow plenty of daylight into the building and, of course, it allows unobstructed views to the outdoors. Easy to install and it performs as advertised. EZ Snap® Team - Saving birds one window at a time... happy to hear about your success story. Cuts down on the heat radiating through your windows and cuts down on the air conditioning cost. EZ Snap® Team - Thanks for the photos. We are satisfied when our customers are satisfied. EZ Snap™ Team - Nice installation Wayne. Thanks for sending your before and after photos. 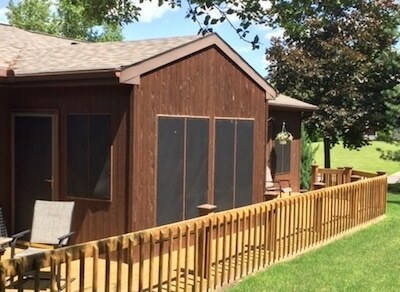 Here are some photos of the installed EZ Snap shades on all of the south-facing windows and doors of our house in central Pennsylvania. We've covered the sunroom (center of the photos) and it has made a minimum 15 degree difference in that room. This has allows me to convert the sunroom to a more useable space - one we can inhabit year-round. Prior to the shades, it used to get into the 90's easily, despite being well insulated. The photos are a bit deceiving as those windows are floor to ceiling. In the other rooms which are now covered, It's making a huge difference helping the AC keep up in the mid-day heat, and making the house an even temperature throughout. We're thankful EZ Snap worked with us when we required more snaps than were supplied with our 50' roll. I'd gladly recommend your product for its effectiveness, ease of installation and how we're still able to open and close the windows as weather permits. The only recommendation I'd make is for a much larger number of snaps to be included with the longer rolls. EZ Snap® Team - Thanks, we appreciate your positive review. EZ Snap® Team - Thanks for your review and your continued business. I had a hot tub cover with the core being melted and warped my the reflection from my bedroom window. The magnifying effect was so intense. It was easy to put on I like the fact it can be taken off in winter. EZ Snap® Team - Thanks for letting us know! EZ Snap® Team - Glad to hear it... works every time! 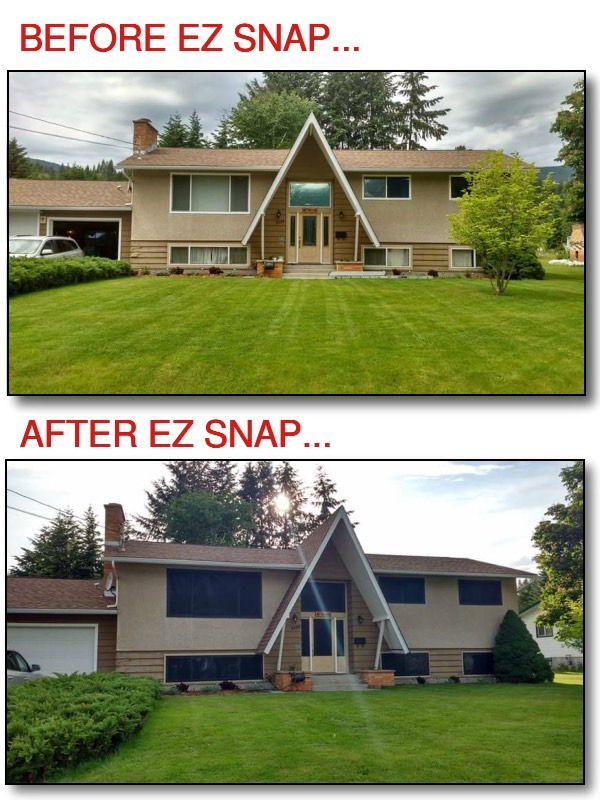 EZ Snap was an affordable way for us to solve an issue in our home! We originally looked to replaced older windows in our daughters room and office. These windows face southeast. Each day the sun would rise, these two rooms would go up in temperature significantly and the room would be stale, unbreathable during the summer months in particular. I did some research on government websites dedicated to energy conservation and they mentioned options for reducing energy costs. One of the options was to have the windows replaced, the other was to use an exterior shade. After researching and pricing, we found the the EZ Snap product. It was far more affordable and a much quicker solution to our problem. It also did not require us to hire contractors as my husband was able to easily install. The customer service team was also very helpful when we called with minor questions. The best news is that I can once again work in my office during the summer months. More importantly, my little one is able to sleep in her room again! Perfect air flow once again. The bonus is that the rest of our home has benefited as well with reduced temperatures throughout. We only have central air so this is a definite plus for us. EZ Snap® Team - Great news. Thanks for letting us know. My son has just installed the mesh. Instructions were very easy to follow. The product was up in no time. We are extremely pleased with product. We bought the 50' kit and installed the shades on all our windows and doors in about 8.5 hours, the claim of a reduction in temp. is true fact. This product has reduced our temp. inside at least 15+ degrees. EZ Snap™ Team - Thanks for your positive feedback Wayne! This product was very easy to install. Instructions were easy to follow. Product has the feel of a durable quality material. EZ Snap™ Team - Nice work Lance... 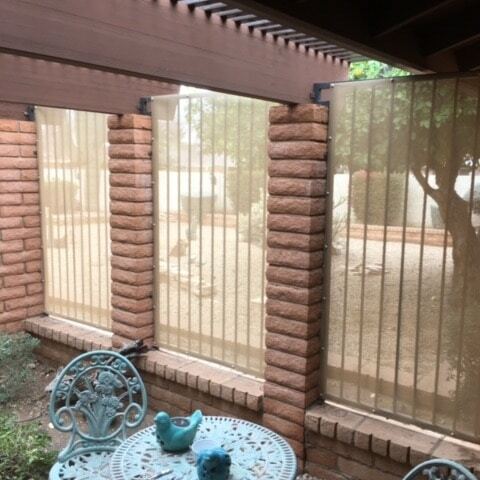 Beige was definitely the best choice for your patio screens. This was the best money we spent all summer (if you don’t count my husband’s new boat). EZ Snap screens have made such a significant difference to the second floor. The whole house has benefitted. We really do love them. EZ Snap™ Team - Great feedback, thanks. I was worried that the 3M studs would not stand up, as I had read some negative reviews on the web about them. The more I researched though, I realized that the negative reviews were all about the product that Coolaroo use to sell. Apparently, the EZ Snap studs that Coolaroo was selling was a discontinued product and used the original version of the studs. The new and improved studs are bigger and are made differently. I have had the studs I bought from EZ Snap installed for over 8 months now and they are all sticking just fine. The studs that EZ Snap sold me are 7/8” across and the old Coolaroo ones are only ¾” in diameter. Make sure that where ever you buy your EZ Snap, that they are the new larger ones. Great product for keeping the sun’s heat out. It has lowered the temperature in both rooms that I put it on. Great product. Delivered on time by UPS. This product is what I'd expected. Very easy to install. Thank you. What a difference! Easy to install and looks great on my windows. I would recommend this to anyone that needs to protect the inside of their home or floors from damaging UV rays in the summer. The adhesive snaps work well on glass or metal, just make sure you wait at least 24 hours for the adhesive to really bite onto the surface, before you install the shade cloth material that comes in the kit. We are really happy with the EZ Snap System screen. Our house has a room with a with a very large window facing east. I placed a thermometer in that room through the summer. On sunny days, the thermometer commonly read 30c (86f). This was the reading, even though the air conditioner was running and other rooms in the house were being maintained in the low 20 degrees Celsius. We made sure all vents were completely open in the room. We first installed interior solar shades and even blackout window blinds. These two items did help some, but the room was still unusable and very hot. We even paid for a HVAC company to do an inspection. They said the insulation, ducting etc was good. The problem was the heat load from the window. This window was only 3 years old and so we thought the only way to fix this would be to replace the window with a smaller one. That solution solution was going to be a huge project, as well as very expensive, as that section of the house has a stone exterior. Before we downsized the window, I thought I would research one more time and look for a less expensive option. 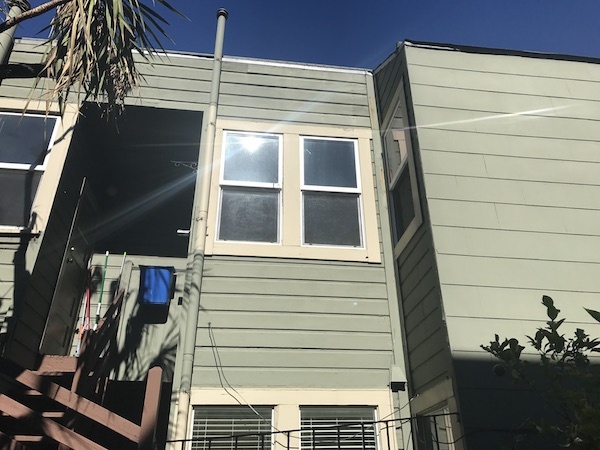 I found the EZ Snap exterior shades and figured for less than $200, it was worth a try, especially compared to the new window, which was going to cost thousands. THIS SHADE SYSTEM IS FANTASTIC. The shades look good on the house, although I noticed that when I installed them that I put a few wrinkles into the fabric in the corners. Most important though is that they are the functionality and they work. We put the shades up on a hot Summer weekend. On day 1 (Saturday), before the screens went up, the room was 29 degrees by 10:30 AM. The outside temperature was 25 degrees Celsius. On day 2 ( Sunday), with the screens up, the room never got warmer than 23 degrees. The outside temperature was also 25 degrees Celsius. Since installing EZ Snap, the thermometer in that room shows the temperature is now remaining the same as the rest of the house. I'm a little shocked every time I walk into the room, as I expect to be hit by a heat wave. Problem Solved. Love this stuff, made a huge difference in the heat allowed into the house. “…The package arrived promptly and then I realized I also needed some stick on snaps, they arrived in three days. Total time to cover all my windows on a 2500 square foot patio home, about one day. Instantly my air conditioner is able to get my home to about 75 degrees. It was not breaking 83-85 before and it NEVER turned off. Best US $400 ever spent, that’s including the special tool to install the screw in caps. Thank you from Houston, Texas and our hottest summer so far on record. I love the solar screen and it is really helping with the intense sun coming into my window. Hi guys. 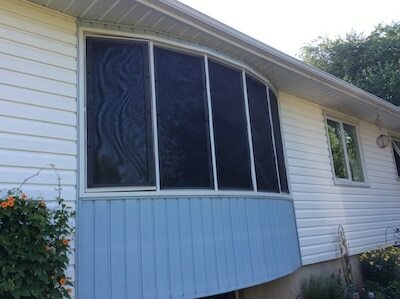 I spoke to you on the phone last week regarding the EZ Snap shade screens we installed on our windows. Wanted to let you know how pleased we are with the coverings. We live overlooking Okanagan Lake with our living room, dining room and kitchen windows all all having a southern exposure. We decided to cover all the south and west facing windows with the shade screens. Wow, what a difference it has made to the temperature in our home! In past summers we would normally run the air conditioning from around 11:00 in the morning till later in the evening but since we have had the screens on our windows we have only had the air conditioning on for 2 or 3 days this summer and then only in the later part of the afternoon on the really hot days. Generally, with the screens installed, it keeps the house temperature at around 25 degrees Celsius (77 F). This is the temperature we would normally have set our air conditioning at! My wife and I figure it has dropped the inside temperature about 4 or 5 degrees. So our house now stays cool, we still enjoy our incredible view, and we hardly use the air conditioning. Lastly, installation was easy. I had my son help me with the higher windows and we got the windows covered in a day. Its a great product for the hot Okanagan climate, that is effective, easy to install and a cost saver. I would have no problem recommending the screens to my friends. Cath, my wife, is very pleased. She feels the lower temperature already and likes the view outside. I like how easy EZ Snap was to install and the temperature reduction. EZ Snap™ Team - We're pleased when our customers are pleased! Living in Vernon, B.C. during the intense heat of summer use to mean, being secluded in a closed curtain home, trying to keep the heat out. Now with our new EZ snap solar blinds, it means enjoying the beautiful views of our sunny garden. Cheers to you EZ Snap for inventing this eco friendly alternative to air conditioning our home. Bamboo blinds are so 1980, we love our new blinds! I think these shades are a very ingenious idea – keeps the heat out in hot weather – no more ugly bamboo blinds in front of my windows to block the heat – I Love it. Here are a couple of pictures of the screens I put on my house. EZ Snap™ Team - Thanks for the photos. Glad to hear you love them. Thank you again for the Sunshade my wife and I recently purchased from you. The installation was a snap. My wife is very pleased at how it looks on the windows and how well it keeps the heat out. …I have already seen a dramatic decrease in indoor temperature and with summer coming I am sure the shades will reduce my AC costs significantly. If the sun screens work here they will work anywhere, guaranteed! Your product works great and saves $$$. I estimate I saved over $1000 over conventional aluminum sun shades. In fact if anyone in the area wanted to see the shades I would be happy to show them. Feel free to give out my e-mail address [email protected] for contact. P.S. My friend was so impressed with the shades he will be ordering materials to do his home in Scottsdale. EZ Snap™ Team - Thanks for your great review. We appreciate your support and referrals. Another suggestion is for sliding doors. I have attached with the sticking fasteners to the stationary side of the door and then replaced the screen on the screen door for the other side of the door. As long as the screen door is kept closed (and the sliding door) then we are covered. This idea might be a suggestion for others to try too. I like the product for windows that we never remove the screening. I have used it for about 6 years and it still looks the same as the day I put it on. 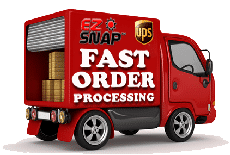 Hello EZ Snap, I received my order and installed the same. Wow, what a great reduction in heat transfer. 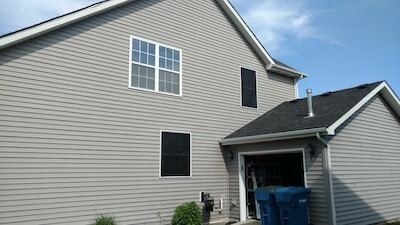 I installed EZ-Snap on my south and east facing windows last year (west windows are shaded by a porch). I agree completely with the other testimonials about the temperature decrease and added comfort. Also I have to mention the reduced glare. We have a large east-facing dining room window that was impossible to look out of in the morning hours due to the brightness. We always had to keep the shades drawn. No more -- it's great to be able to enjoy our east view in the morning hours. Another compliment -- living the USA Midwest we experience hot summers and cold winters. Last fall I removed the shades because we want to let the sun in during the cold winter months. I removed 3 standard window shades and the large dining room shade (which requires a 24 foot extension ladder) in less than 30 minutes -- that includes rolling and storing the shades. I made sure to indicate the location and position of the shades. Using the tool made the job very simple. I just reinstalled the screens - absolutely no problems. All snaps stayed attached and the reinstall was less than 30 minutes also. Great product! I have just reinstalled my screens for their 4th summer. I have to mention that out of 72 peel & stick fasteners on my vinyl windows only 2 have failed. They have endured temps ranging from 100+ to -16 below. I'm amazed at their performance. Also there has been absolutely no degradation of the shade material itself - it looks and performs as good today as it did when first installed.